The GtkFileChooserDialog is a subclass of GtkDialog (see diaogue article) and provides opening and saving of files and folders. The dialog can be added from the "Toplevel" section of the widget sidebar. In addition to the file browser itself the widget has an intern GtkBox for additional widgets and a GtkButtonBox as "action area" for buttons. 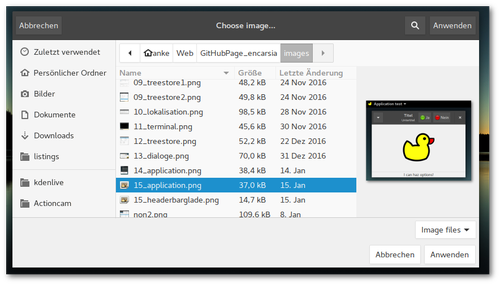 First the Gtk.FileChooserAction mode must be defined (see Python GI API Reference): open or save file, choose or create a folder. The response signal is emitted on widget interaction in the action area which also passes the response value. So for these widgets there is no need to activate the clicked signal of buttons. By default the "action area" is generated beneath the file browser area. This message is not shown if buttons are not added to the intern action area. If a headerbar with buttons is created in Glade the buttons cannot be assigned to a response value. This works but this procedure is surely not the intended way to deal with the problem because after altering the Glade file the edit is retracted. The add_action_widget adds activatable widgets to the action area and hold a response value. This includes widgets of the Gtk.Activatable class: Buttons, MenuItem, RecentChooserMenu, Switch and ToolItem. To apply file selection on doubleclick the file-activated is also required in addition to the response signal. The dialogue can contain an optional preview widget. To use it activate "Preview Widget Active" and choose a free widget (p.e. a GtkImage). It may be necessary to create the preview widget in an empty container widget and pull it into a free area. If the preview requires a refresh the update-preview signal is emitted. Files can be filtered according to certain criteria by using FileFilter. There can be defined several (shell style glob) patterns or MIME-types for each filter. In Glade filters can be found in the widget sidebar in the "Miscellaneous" group. A filter for a dialog can be selected in the general widget properties. This corresponds to the set_filter function.